This is the big news for the edu market Classroom is available with iOS 9.3. This app works with a MDM and offers to teachers a management console giving them full control of students’ iPad during their course. Abelionni has already worked a lot of time with the edu market, and we can say it’s the main request from staff: being able to control students action on their iPad. Until now, the only solution available to answer this needs was the MDM provided by JAMF: Casper. This MDM is usable in all kind of environment but offer a special apps for iOS called Casper Focus. It was allowing the teacher to interact with the MDM and manage their class. Classroom now standardize everything. Like other MDM features, all software editors now have the same capabilities all implemented by Apple directly in iOS. Concurrence between MDM editors now can go back on essential and mismanaged points like resilience, user experience and price. Now let’s take a look at the technic and what it means from now to conduct a one-to-one scenario in edu. To illustrate it we will use Profile Manager, the MDM provided by OS X Server. It offers all functionalities needed in a simple enough user interface for almost no money. To ensure all readers have the same level of understanding, this article will talk about all steps needed, from the initial setup to the class management. This is a good way to remember to everybody what it means iPad in education. Upcoming screenshots are in French, we’re sorry but they aren’t that complicated and it’s a too time consuming to maintain a lab in two different languages. The minimum requirement to the number of iPads linked to a one-to-one deployment is simple: a MDM, a really good wired and wireless network and a big Internet access. It’s common to see school with a correct estimate of the cost for the iPad, but without any thought of what it means from the connectivity point of view. It will never be said enough: to successfully manage an iPad mass deployment, the main investment is the network. Without a robust WiFi network with a robust wired network on the back with a robust Internet access on the back, your iPad mass deployment will finish in a wall. a caching service at least for iOS and tvOS updates. Regarding Wi-Fi access point, the main player on the market is AeroHive. Their products are expensive and for rent only, but they still are the only one made for performance and iPad mass deployment. The management console gives access to all settings needed for fine-tuning. For the switched network, a classical infrastructure with access, distribution and eventually core layer is recommended. With all uplinked in fiber and doubled. Distribution devices must be layer 3 switch in stack mode, in charge of the internal routing. If the organization has different buildings (like college), the network core must be layer 2 in stack too and all distribution equipment must support dynamic routing protocols. It’s important to keep in mind that stacking is used to improve the service level agreement and not the number of ports. A 48 ports switch cost less than two 24 ports in stack. 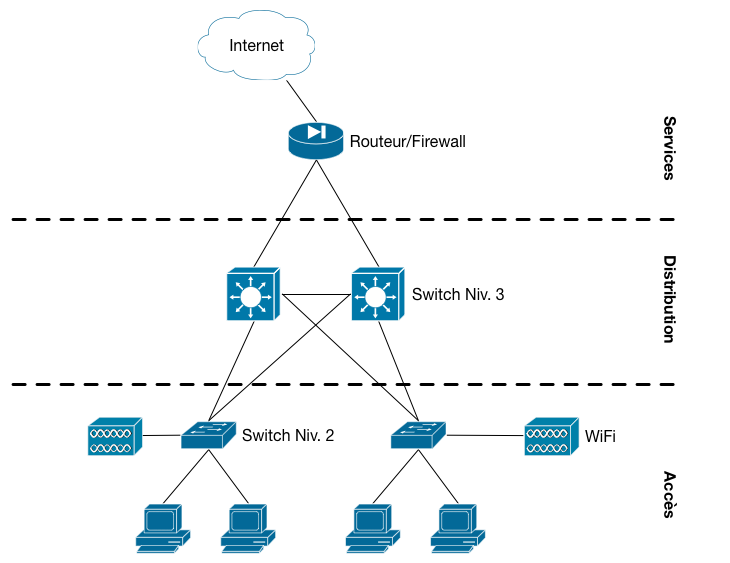 A stack of switch is needed to spread uplink from the same access switch to two different hardware working together. If one fails, the network still work. For the Internet routing and filtering, the Cisco ASA X product line is recommended, 5506-X or 5516-X depending on the number of students and Internet access. FirePOWER and FireSIGHT licenses must be taken with to allow deep packet inspection and filtering. Keep in mind, it will be used to allow children to access to the Internet, even during break time with their iPad. You don’t want them to be able to access to pornographic web site when they are under your charge. If you really take this point in consideration, you can also use products like Artica Proxy to setup Internet filters even when the iPad is outside the school. Artica Proxy can also be used in place of FireSIGHT to reduce the cost. Internet access must offer a guaranteed speed rate. Don’t expect anything with residential or “pro” Internet access. For hundreds of iPad, a fiber access is needed. Start with 20 or 30 MB symmetric access with guarantee and adjust over time. Regarding iOS and tvOS update, it will consume a lot of Internet when all your devices request the update at the same time. Caching service provided by OS X Server is mandatory. Tips, if you want the best performance with Apple TV used for iPad display on the video projector, connect them via an Ethernet cable. Wi-Fi access isn’t reliable for this kind of deployment. One thing to keep in mind with this recommendation: it’s not because resellers offer them they are able to use them correctly. It’s common to see big players with a good reputation in this market following this recommendation and falling to make it work. Story of schools with hundreds of iPad still in the case years after being bought aren’t that uncommon. If you’re in this situation, you can contact us for an infrastructure audit. We will give you an audit report with all errors made by every player in your project and we will list solutions available to make it work with the minimum amount of investment. And you keep the freedom to request whoever you want to apply our recommendations. Whatever the provided you select, please be sure to evaluate its technical capabilities. If you need, we can offer project management services. If we are too far from you and it’s a problem for you, we can work in a one shot method to evaluate reseller offer and technical knowledge of their employees. We will organize technical talks with all employees involved in this project by the reseller and give you a list of competent and incompetent name for your project. Mobile Device Manager choice is essentially linked to personal affinities with the sales man. All editors are restricted by the same limitations made by Apple. No one has any free pass and with Classroom now, not a single solution has a real unfair advantage on others for the edu market. 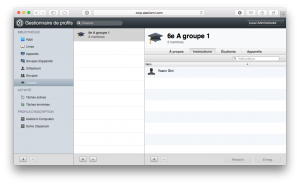 For this article we will use Profile Manager sold on the Mac App Store at 19.99€ in France. The product is supposed to be able to manage 5000 devices on a simple Mac Mini. Even if for that amount of iPad a virtualized infrastructure with Mac Pros should be better, Profile Manager is still a simple solution that does its job correctly. The only limitations are: must run on Apple hardware, support only Apple hardware. Initial configuration requires a Mac with OS X Server and a static IP address for internal networks and also for Internet access. A fully qualified domain name must be available (for example apple-mdm.school.edu) and must resolve to the internal or external IP address depending on the iPad location. You MDM must also be linked to DEP and VPP services. DEP and VPP are two free programs provided by Apple. DEP means Device Enrollment Program, it allows you to buy iPad who will automatically be registered in your MDM during the activation process and supervision will automatically be enabled (to allow more advanced restrictions). 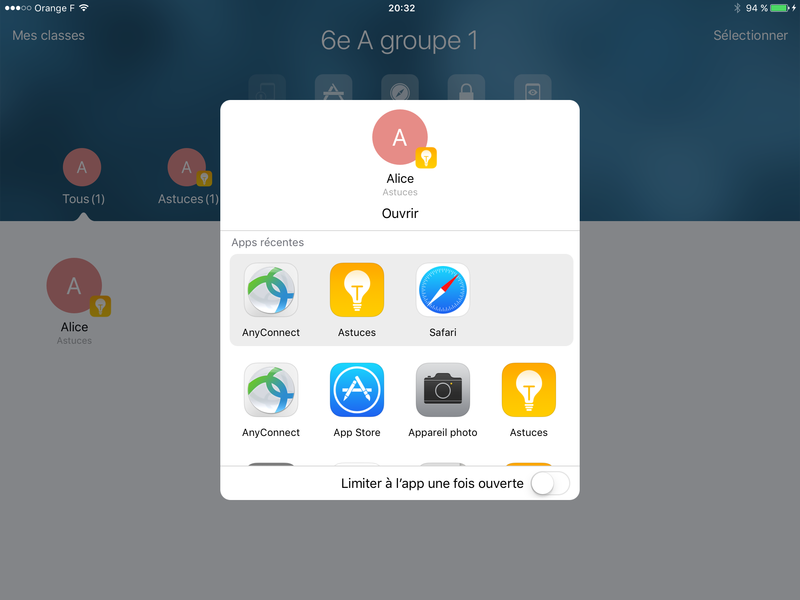 This means during the iPad activation process (initial or after an erase), the assistant can be personalized by the MDM and optional user IDs. VPP is the volume purchase program for the App Store and the Mac App Store. It allows centralized acquisition of app licenses (free or not), the right of usage belong to the organization and is given temporarily to a user or a device. the iPad customization is done, it’s now in the inventory, restrictions are applied, mail and calendar set up, applications pushed. Don’t forget paperwork to give responsibility for the iPad to the student and verify the packaging content (iPad, cover, lightning cable, power adapter…). Now everything is set, we can use Classroom. This application distributed to teacher iPad must be set via the MDM. In Profile Manager you must create all classes needed. For all classes and class groups, you must indicate the students, the teachers and the devices included in the class. For this last point, if your college allow personal devices (BYOD) to be managed by your MDM to give access to e-mails and calendars aside your edu iPad, you don’t want teachers being able to interact with personal devices, only edu one. In Profile Manager, its look like a dedicated kind of group with three simple lists. It’s mandatory to create as many classes and sub classes as needed. If a class can be split in two sub group to follow different courses at the same time, you must create your sub group in the MDM to allow your teacher to select only the requested sub group. Teachers will also be able to manage dynamic groups during their time depending on their needs. Classroom apps must be added to apps catalogs provided to teachers. When they start the app, they will be allowed to choose the class and be able to manage what students are doing on their iPads. The teacher has all information needed on a single screen. The button in the upper left corner allow to select the current class, and the one in the upper right corner allows teachers to create custom subgroups. Central buttons are for group actions. In the quick access functions we have user assignation for shared iPad, we won’t use it in this scenario. 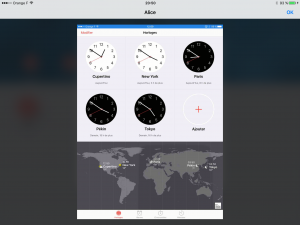 We also have a feature use to open a target app on all iPad, and awake and unlock them if needed. Be careful, this functionality use local apps to offer a choice. Classroom doesn’t request list of apps installed on target iPad. If app selected by the teacher isn’t available on the target iPad, an error message will be displayed, only for the teacher. It’s also possible to open content in iBook and Safari. The Safari content is taken from the bookmark list in the teacher iPad. He will be able to select a bookmarked website and request students’ iPad to display it. For the books, same behavior, teacher iPad is used as a reference, teacher will be able to select at which chapter the book will be open. This works with books from the iBook Store or internal book used with iBook. The next function will be enjoyed by teachers. It allows to lock all iPad, making them unusable until a release order from the teacher. Useful when it’s time to get back student mind. The last mass action allows the teacher to display all student iPad screen in a thumbnail. This function is linked to AirPlay, the screen will be displayed in real time but in a small size. This allows teachers to keep a global eye on all iPads at the same time. This function works with AirPlay, so students will see status bar paint in blues when the iPad is watched. Under all mass action teacher will find dynamic groups. Classroom manages dynamic group displaying all users and all users on the same app. If the teacher split its class in sub workgroup, Classroom can be used with the upper right button to reflect those groups. All previous actions are available as directed action for a single iPad. Directed Action also offer specific features. One of this feature allows the teacher to force one iPad to be displayed on the Apple TV discovered on the network or pushed by the MDM. For students who lose their secure code, teacher will be able to unlock the iPad from Classroom directly. No need to call IT support for that. And teachers will also be able to show one iPad screen in big format to follow what a specific student is doing. 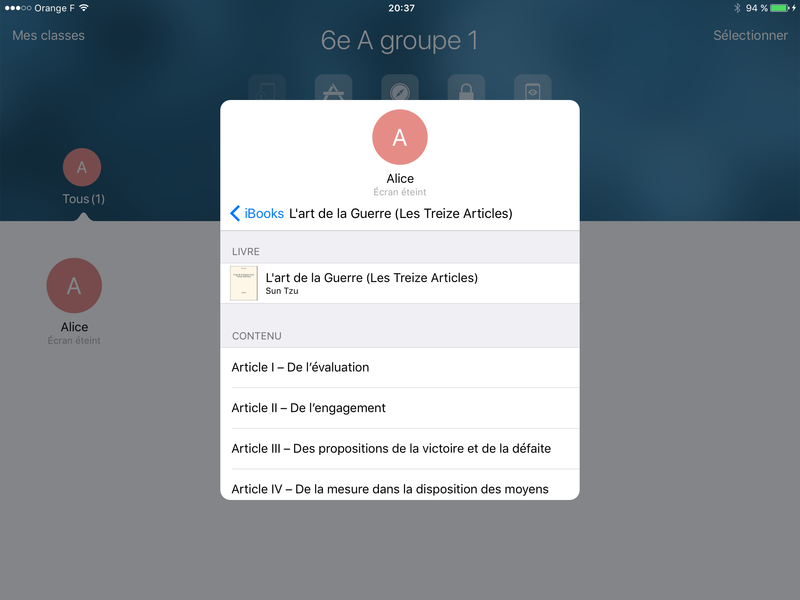 Assignment and disconnect actions are specific to shared iPad. With iOS 9.3, Apple has just opened the iPad edu usage to more school than ever. OS X Server is almost free, cost links to iPad mass management in edu is close to zero now. The real cost for the school is linked to the wired and wireless infrastructure, and for the families, it’s just the iPad rend with buy options at the end. On this topic, it’s very common to report the iPad cost on scholarship fees for 3 or 4 years with an eventual buy option at the end of 1 €. This kind of technical, financial and pedagogic scenario is something really common for Apple Store and member of the Apple Consultant Network. Go to your closest Apple Store to be helped in your one-to-one project and being introduced to the closest and most appropriate consultant for you. In any case, Abelionni is available for all this kind of project across the world.